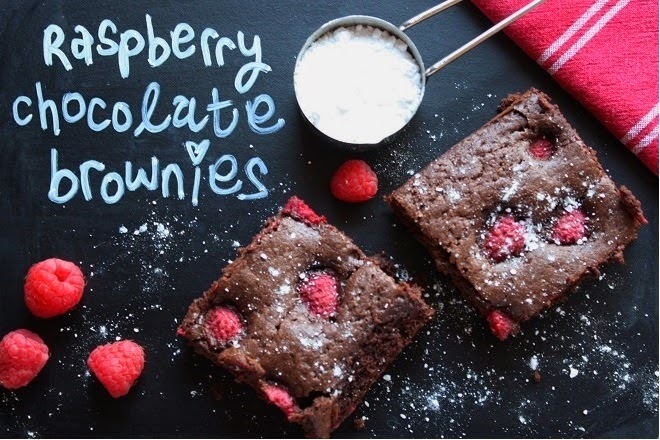 Inspired by Catherine and Emily these brownies are delectably gooey and chocolatey and you then you get a hit of tangy raspberry too. And with some vanilla ice-cream it is absolute heaven. Perfect for dessert or as a naughty treat in the afternoon. Preheat oven to 180 degrees, grease and line your baking tin, I used 20 x 30cm. Put the chocolate, butter and sugar into a pan and melt gently and remove from heat. Stir in the eggs, then sieve in the flour and cocoa and mix until combined. Pour into your baking tin and scatter the raspberries over the mixture. Cool before slicing and store in the fridge.